Another month down, and we head into the Autumn months and Disneyland Paris’s spooky Halloween season, and some exciting Halloween pin releases! Umm… well…. So, no new Halloween pins, however I understand that last years pins will be put back on sale, and we go straight into Christmas. I adore the 2013 Christmas visuals and this years booster set looks fantastic, the two stand alone pins are Chip and Dale and a Mickey and Minnie Pin (This one being remarkably similar to last years). Duffy is hugging a Mickey gingerbread man in his pin. This months Princess carriage is Snow White, and looks nice (if you like princesses). The fantastic Phantom Manor lanyard has arrived, perfect for your attraction collection pins! I really like that the Phantom Manor spooky wallpaper has been used on the lanyard, I know there are lots of fans of this attraction and so this is going to sell very well. 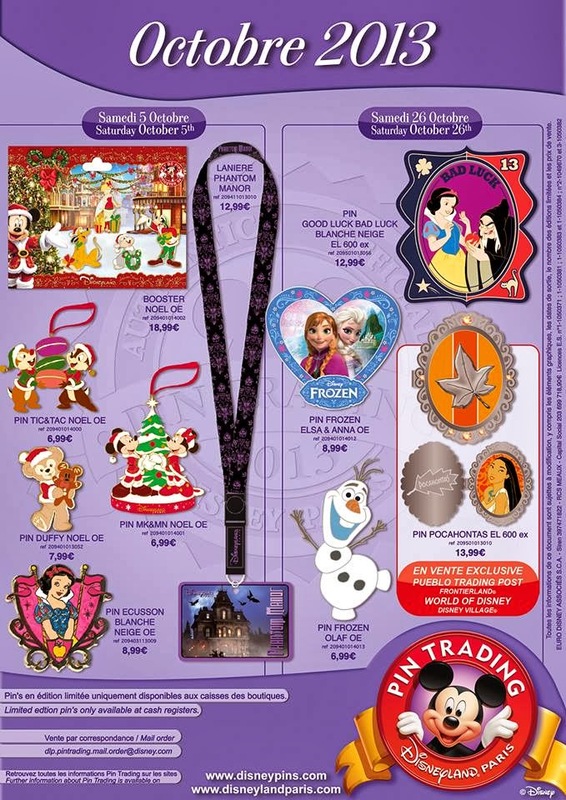 Moving onto the end of the month and Frozen, Disney’s 52nd Animated Classic makes its debut in the pin trading circles. The Olaf pin is going to sell very well (and I think he’ll be an incredibly popular character), especially since he will be hosting ‘Disney Dreams of Christmas’. The Princesses Anna and Elsa appear on their own pin as well. The good luck/bad luck series continues with Snow White, those of you who follow my pin posts know I’m a huge fan of this series and would love to add this to my collection as well. The princess lockets continue too with Pocahontas being released later in the month. And that’s it for another month! I hope some pins on the poster catch your interest, I know I’ll be buying those Christmas pins! PreviousPrevious post:20th Highlights: Disney Dreams!NextNext post:What’s New, What’s Next Day 2 Recap: Merchandising!